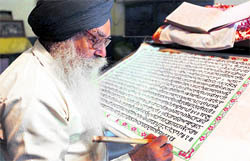 Gurmeet Singh (72) works on a handwritten version of Guru Granth Sahib at his home in Amritsar on Tuesday, the eve of the celebration of the 406th anniversary of the installation of Guru Granth Sahib in the Golden Temple. Gurmeet Singh, who began his work on May 7, 2004, completed it in six years and two months. Can I get the address of this Gurmukh Pyaare ...I want to meet him personlly. Please if possible can somebpdy arrange it for me..!! !